Salmon is one of those ingredients that elevates a meal to something special, whether it’s brunch or the perfect bite-sized canape. Chris Roberts’ (of Roots at Waterfall SUPERSPAR) quick recipe is ideal for book club with the ladies. 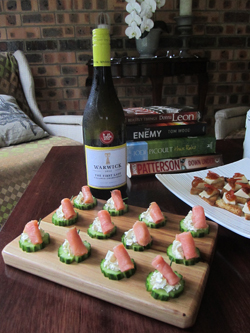 Serve with Warwick The First Lady Unoaked Chardonnay. Cut cucumber into ½ cm rounds. Combine the cream cheese, lemon juice, parsley and chives. Season well. Cut the smoked salmon into 2cm squares and roll up to form mini cylinders. Pipe the cream cheese onto cucumber rounds. Angle the smoked salmon on the cream cheese and garnish with chopped chives.